We’d love your help. Let us know what’s wrong with this preview of The Complete Works of Francis A. Schaeffer by Francis A. Schaeffer. 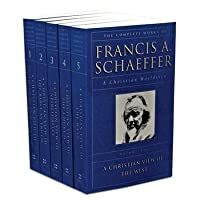 The Complete Works of Francis A. Schaffer Set Includes: Volume 1 is Christian View of Philosophy & Culture. It contains the following books: God who is There, Escape From Reason, He is There & He Is Not Silent, Back to Freedom & Dignity. Vol 2 is Christian View Of The Bible As Truth. It contains the following: Genesis In Space & Time, No Final Conflict, Josh The Complete Works of Francis A. Schaffer Set Includes: Volume 1 is Christian View of Philosophy & Culture. It contains the following books: God who is There, Escape From Reason, He is There & He Is Not Silent, Back to Freedom & Dignity. Vol 2 is Christian View Of The Bible As Truth. It contains the following: Genesis In Space & Time, No Final Conflict, Joshua & The Flow Of Biblical History, Basic Bible Studies, Art & The Bible. Vol 3 is Christian View of Spirituality. It contains the following: No Little People, True Spirituality, New Super Spirituality, Two Contents Two Realities. Vol 4 is Christian View of Church. It contains the following: Church At The End of The 20th Century, Church Before The Watching World, Mark Of The Christian, Death In The City, Great Evangelical Disaster. To ask other readers questions about The Complete Works of Francis A. Schaeffer, please sign up. This series of the complete works of Francis Schaeffer is certainly a worthwhile read. Most of his ideas were generated before I was born, and most of his writing was done when I was a young child. It was interesting to see how relevant much of his writing still is 40 years after they were written. As a series of books, these had far too much repetition. By the time I was on the final volume the books were mostly repeats of earlier works, albeit with a different purpose and target audience. Some of the books (e.g. “The Church at the End of the Twentieth Century” and “The Mark of a Christian”) I thought were completely outstanding, while others I disagreed with and thought were poor (especially those in the final volume). Through the series Schaeffer thought did not change, but his goals did. Initially he wrote as a Christian academic who wanted to engage all people in thought. His last writing was mostly drum beating to engage Evangelicalism in politics. History has shown that only the right wing accepted this challenge and unfortunately ignored Schaeffer’s nearly (but not quite) balanced views, by only adopting the politicization of Evangelism and ignoring Schaeffer’s plea to minister to the complete man. Schaeffer’s book is all about communicating true Christianity to a relativistic generation, which is more entrenched today than it was when the book was written. Schaeffer approaches the world from multiple perspectives: theology, philosophy, art, literature etc. Unfortunately, he mostly ignores science, which is too bad. The message about how one must communicate Christianity was very much worth reading. His main point, is that Christianity is based on a real God (who is there), the creator of all things. Jesus is a real person who actually lives, who is real in history. This book was based on a series of talks which were given at the same time as “The God Who Is There” was written. As a result there is a large amount of overlap in the two books. Too much. In most respects, reading “Escape from Reason” was a waste of time after completing the previous book. In addition, “Escape from Reason” really only covers the first half of “The God Who Is There” as it outlines the history of the intellectual development of twentieth century man, as he spirals into despair and nihilism. This book was entirely concerned with knowledge, and how we can know anything. The book plodded its way through a discussion on how we can know anything. The bottom line was that without an infinite personal creator, there is no way that we can have confidence about knowledge. While the book in many ways was useful, it was also overly verbose and dull reading. This book was very enjoyable and also well written and philosophically was still entirely current. The book is really only a series of review essays dealing with various popular articles or books. All of the articles discussed were centred on the theme of man being only a machine and therefore entirely determined by either the environment or DNA. Schaeffer does an excellent job showing how each of the authors being reviewed was ultimately inconsistent or naively utopian. Genesis is Space and time was not at all what I expected. The book is theological, and not at all scientific. This was rather disappointing, and seemed to me (as a scientist) to be at least partly inconsistent or naïve. The basis of the book is that the book of Genesis is based on real history that really happened. My basic problem with the books was the way Schaeffer avoided every difficult issue between science and Genesis. For example, he argued for no death before Adam, and the future reality of lions eating straw, but left the flow of thought hanging. The book was a mild theology book dressed up with a bit of scientific language, and thus my low rating. This was a very short booklet that in many ways was an addition to Schaeffer’s previous book, “Genesis in Space and Time”. Unlike the previous book, in this one Schaeffer was clear on what the purpose of the book was, and fulfilled it. Even though I do not agree 100% with what was written, the message in the book is even more important today that when it was written, just as predicted by Schaeffer. Ultimately, he argues that there is no final conflict between science and the bible – I totally agree. He seeks to outline limits on what the bible could be construed as actually saying in areas where it touches on scientific topics, like the age of the world. “Joshua and the Flow of Biblical History” marks a strong shift in Schaeffer’s writings. While the book presumes that his previous books have already been read, this was not really necessary as the book stands nicely on its own. Rather than being a book centred on philosophy, this one is really a bible study book based on one particular background premise – that the bible is all writings from God based on real historical events. With this as a background, Schaeffer does an outstanding job of gleaning both historic and modern insights from the rest of the book of Joshua. It is these numerous insights that really make the book shine. In this tiny book (first published in 1972), Schaeffer creates a miniature systematic theology book in bible study form. Schaeffer does an excellent job of walking the reader through much of what is Christian Theology, provided they are doing their scriptural readings. The vast majority of this book, I thought was outstanding. The unfortunate part came at the end, where Schaeffer pushes one particular eschatological view in the same method and tone of the rest of the book. There is nothing in the book to imply then, that the rest of the book equally may have multiple views by Christians, each of which is as good as the other. I am disappointed that Schaeffer chose to imply that this grey area, which Jesus made clear no one know, was as certain as foundational issues. This was a horrible way to finish what would have otherwise been an admirable bible study book. The tiny book was important and Schaeffer did an excellent job going through the issues. He did such a good job, that while reading it seemed that everything was obvious. This was not the case, rather Schaeffer was able to simply walk the reader through his logical thought. Unfortunately, I was not very interested in the topic, and was relieved to have finished the book. “No Little People” (published in 1974) is a collection of sermons by Frances Schaeffer. The majority were based on a particular scripture, rather than topical, and these were arranged in biblical order. At the end were two topical sermons to complete the set. The book was designed for the reader to complete one chapter at a time. As a result, it took me a considerable amount of time to complete. The sermons are all excellent, and I especially liked the very last one on materialism, which is just as relevant today. But, reading random isolated sermons is not something that I would seek to do, and this leads to my average rating of the book. “True Spirituality” was developed as a series of talks at L’Abri. The first chapter of the book was outstanding, important and entirely relevant. Schaeffer is dissecting what true spirituality is, and concludes it is certainly not correct theology or even righteous living. Instead it has two components: inward and outward. Schaeffer argues that the inward component it not to covet others or God, and that all other laws or biblical instructions fit if lives their lives to God. I am not convinced that the argument is water tight, but he does a good job making his point. The outer component is not living according to rules, but rather living in a positive light as a child of God. Schaeffer’s book: “The New Super-Spirituality was written in 1972 as a commentary on current trends in the church, which were (and are) alarming. It is more of an essay than a book, and can be finished quickly. The book talks about the trend in the 60s and 70s for youth to rebel against things wrong with their society and/or church such as: materialism, selfishness, hypocrisy, emptiness, and anti-intellectualism. Schaeffer reminds us that true spirituality is about what we believe, but also about what we do with this belief practically. He reminds us that true spirituality is based on real truth, and we need to use our heads and intellects in seeking this truth. This is an excellent position paper, which was presented at the International Congress on World Evangelization in Lausanne in 1974. In many ways, it is a distillation of the core of What Schaeffer stood for. The “Two Contents” are sound doctrine and honest answers to honest questions. The Two Realities are true spirituality and the beauty of human relationships. As long as the basics of the faith are present then we are all part of the body of Christ, as the scriptures makes clear, for example: “By this, all men will know that you are my disciples, because of your love for one another”. This book, written in 1970 was outstanding. The book talks about what the church needs to do to stay truly relevant. He talks about the huge importance on a strong biblical basis, while recognising that the Bible is God’s word and what it says is true throughout. He also talks about the huge need to be able to answer questions, and to think. He also warns about allying with political trends when we agree with certain issues. He suggests that we act as co-belligerents, but never allies. If this final advice was followed, we would not have the many of the political “Christian” right (or left) movements that are so embarrassing today. While still highly relevant, the book showed its age considerably more than Schaeffer’s book: “The Church at the end of the Twentieth Century”. The book begins with a reminder of how “liberalism” has removed Jesus and Christianity, from much of what still calls itself the church, and how much of disaster this has been to the perception of the church in the watching world. By abandoning proper doctrine, this is apostasy, or spiritual adultery, since the emphasis is taken away from the bridegroom – Jesus, and is attached to our on intellect. Similarly, when we are excessively “conservative” in our biblical Christianity, we can lose our love of God, and end up doing the spiritual equivalent of abandoning our spouse. Both errors will end in a disaster, and Schaeffer carefully examines each in turn. Schaeffer’s booklet entitled: “The Mark of the Christian” is excellent. It is based on two key passages in the Gospel of John. The first passage is when Jesus says in the 13th Chapter of John: “a new commandment I give to you: love one another. As I have loved you, so you must love one another. By this all men will know that you are my disciples because of your love for one another”. The second passage is in the 17th Chapter where Jesus talks about his desire for his disciples to be unified the way he is with the father. Thus by loving each other, and showing unity demonstrates to the world that we are followers of Jesus, and also that Jesus is God. My thought on this book are very mixed. To start with the negative, I almost completely disagree with the worldview implied by Schaeffer. In “Death in the City” he mourns the way in which Christendom has faded and failed in the west. From my 21st century perspective, I am opposed to the concept of Christendom altogether! On the good side, Schaeffer digs into the issues that caused the church to lose its way – thus creating death in the city. In this book he also takes a useful but different approach to suggest that too many people who call themselves Christians are actually living lives of unfaith. That is, they are living as if we are in a materialistic world with no God. This book was a mixture of good and bad. Schaeffer, as usual, had many good things to say but also was a prophet of doom. The book was about the way in which the so-called Christian church has conformed to the pattern and spirit of the world. The warnings were mostly all valid, and Schaeffer’s analysis of the underlying issues were also insightful. The problem I had with the book was Schaeffer’s seeming obsession with the idea of Christendom. He seemed more interested in the ability of Christians to change society than in the ability of God to change the lives of Christians so that we live as salt and light in society. If I was to rate this book on enjoyment, it would receive one star. It was boring and dull in style, and if was not so short I would likely have given up reading it. At the same time Schaeffer has some very useful things to say, and thus I have increased my rating to 2 stars. In many ways the booklet is a Christian response to two articles (which are included as Appendices). These two Appendices were the highlights of the book, which is not a complement. “How Should We Then Live” by Frances Schaeffer is in many ways a summary or distillation of the many previous works by the same author. The book is poorly named, as it spends essentially no time discussing how we should then live, although to be fair, it is implicit through the book. Schaeffer writes what is essentially a philosophical and religious history of Western Civilisation. Schaeffer was highly pessimistic, and seemed to forget the God who is, and optimism that should come from trusting in the God who is in control. For anyone who has not yet read Schaeffer, this would be a good book to read, but after reading his other books, this was largely pointless. The book (and presumably the videos, which I have not seen) is both thought provoking and God honouring, and is certainly a worthwhile read. This being said, I did not like it. The book is concerned with the way that increasingly people are being treated as sub-human, and this is being accepted in the society. In particular there is a graphic description of abortion and infanticide as practiced in the 1970s. This was unpleasant. The book ends with a push for the Christian to be politically active, and as a theological Anabaptist, I disagree with the book’s conclusions. Furthermore, following Schaeffer’s agitation, more than thirty years of “Christian” politics has not improved the moral base in the US. This book did not live up to the title “A Christian Manifesto”, and was a complete disappointment. The minority of the book, which could claim to be a manifesto was centred on purely American “Christian” politics in the early 1980s when the book was written. Schaeffer has taken a particular political view of Christianity and has warped history to imply it was the norm when people actually were following Jesus. I disagree strongly with this particular discussion, as well as the political conclusions that result. I would have given the book one star except that right at the very end (almost as an afterthought) Schaeffer talks about the importance of Christians demonstrating the positive alternate response to what is wrong in society. This afterthought of Schaeffer I agree with. Hands down, the best explanation of the Christian worldview to have ever been written by the hand of man. Schaeffer breaks it down from the smallest components of the Christian faith and really makes you see what you profess to believe--every inch of it. Then he begins to rebuild,using all those components like Legos, each building on the next, until you not only understand each part, but how it integrates into the whole. My only regret is that you can't find the 5-volume set in hardback anymore; Hands down, the best explanation of the Christian worldview to have ever been written by the hand of man. My only regret is that you can't find the 5-volume set in hardback anymore; mine are practically falling apart with use. Best $80 I ever spent. Period. i have only read the first three volumes (of five volumes total) of this set but i recommend it to anyone. he talks about art as it connects to "the line of despair," the unneeded "jump" into the upper story (which means we don't have to cut our heads off to be christians), genesis as a historical book rather than something less than that, and many other topics. he wrote some ideas about what "christian art" might look like. i found that liberating. The Bible should be any Christian's priority read. This should be second. Dr. Schaeffer (L'Abri founder) puts the Christian on firm ground and easily provides reasons to reject alternative ways to interpret, understand, and twist the contents of the Bible to fit 'whatever'. It is an unconfusing (really!) read. Currently I'm in the 2nd volume but I've read many of these books individually over the last 40 years. Just glad to have it all in one place and updated. It was my pleasure to get the opportunity to read this set in its entirety for a readings class on modern church history. Schaeffer's ability to accurately critique culture made him a man ahead of his time. I share his view of the world and of Scripture for the most part, and while he sometimes overstates our position, I resonate with much of what he says. I have long considered Francis Schaeffer to be one of the most influential people on my thinking. His three volume set: The God Who is There, He Is There and He is Not Silent, and Escape From Reason as well as his short volume The Mark of the Christian have been beneficial reads. I decided that this summer, I would try to read through his complete works--22 books, 5 volumes, 2262 pages. Once again, I really appreciated his three apologetics books. His work is essential for any serious student of I have long considered Francis Schaeffer to be one of the most influential people on my thinking. His three volume set: The God Who is There, He Is There and He is Not Silent, and Escape From Reason as well as his short volume The Mark of the Christian have been beneficial reads. I decided that this summer, I would try to read through his complete works--22 books, 5 volumes, 2262 pages. Once again, I really appreciated his three apologetics books. His work is essential for any serious student of understanding Christian worldview and how Christianity applies to all of life. Schaeffer's knowledge of a wide variety of fields: philosophy, art, music, culture, and religion come together well in these books. Beyond these books, I really appreciated Genesis in Space and Time in which Schaeffer defended the truthfulness of Genesis 1-11. He makes a strong call for understanding these early chapters of the Bible. True Spirituality is also a must read, perhaps one of the finest of his books. In this book, he defends the orthodox Christian position. His books Death in the City and The Great Evangelical Disaster further support the need for holding to an orthodox position and standing for True Truth. Finally, his book Whatever Happened to the Human Race, which he co-authored with C Everett Koop was an excellent defense of the uniqueness and value of man. 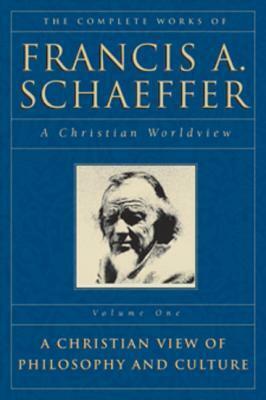 Francis Schaeffer, sad to say, has become a political lighting rod in 2011. Certain political types, who are seeking their party's nomination for the highest office in the land, have stated the importance of his writings in their "so-called" intellectual formation. Reading one author however does not make one a scholar or a public intellectual. The problem with my fellow brothers and sisters in Christ, and I use that term loosely, is that they did not keep on reading and thinking. They stopped. Francis Schaeffer, sad to say, has become a political lighting rod in 2011. Certain political types, who are seeking their party's nomination for the highest office in the land, have stated the importance of his writings in their "so-called" intellectual formation. Reading one author however does not make one a scholar or a public intellectual. The problem with my fellow brothers and sisters in Christ, and I use that term loosely, is that they did not keep on reading and thinking. They stopped. was a visionary and a great theologion. "Whatever Happened to the Human Race" included his views on what was to come relating to the value of life. It's effects on society then and to come. I read a few of Schaeffer's books when I was in high school and college, and he was one of the first people I read who got me interested in intellectual history. Re-reading these books several years later (plus several others I had never read before), I was disappointed at times with the simplistic nature of his arguments. He certainly knew how to paint with a broad brush. Even if his thought tended generally in a good direction, he seemed unfair in some of the details. Nevertheless, the love and I read a few of Schaeffer's books when I was in high school and college, and he was one of the first people I read who got me interested in intellectual history. I'm reading through Schaeffer's books for the fourth time now. It's been over a decade since I last read them, and I find them fresh and meaningful as ever. I went through a 2-semester class at Covenant Theological Seminary on Francis Schaeffer, so that background has added to my enjoyment of re-reading his Complete Works. Brilliant, strong, intellectual stuff. I haven't read anything outside the first volume (I was using it as a source for a paper)- but what little I did read tantalized me to come back for more. Next time I feel philosophical, I'll dip into these volumes once more for a bit of intellectual nourishment. Twenty two books is a lot to work through; but this set is worth the time. Be sure to begin with the first three books in the first volume. This will set the stage for the whole series. He gently pushes the reader to a level of rationale compassionate examination of life that few can equal. He's a wise kind uncle sitting next to you by the fire on a cold winter's night. One of my fond memories from college was reading through Schaeffer's Collected Works. I found his books and ideas very engaging and accessible. Francis August Schaeffer was an American Evangelical Christian theologian, philosopher, and Presbyterian pastor. He is most famous for his writings and his establishment of the L'Abri community in Switzerland. Opposed to theological modernism, Schaeffer promoted a more historic Protestant faith and a presuppositional approach to Christian apologetics which he believed would answer the questions of Francis August Schaeffer was an American Evangelical Christian theologian, philosopher, and Presbyterian pastor. He is most famous for his writings and his establishment of the L'Abri community in Switzerland. Opposed to theological modernism, Schaeffer promoted a more historic Protestant faith and a presuppositional approach to Christian apologetics which he believed would answer the questions of the age.